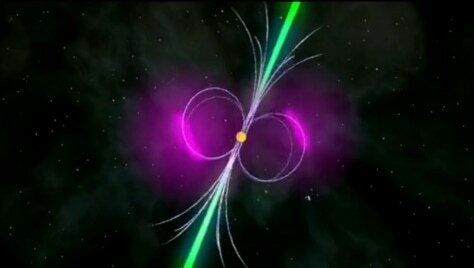 This still from a NASA animation depicts the super-bright and super-young pulsar J1823-2021A, which is the brightest and youngest pulsar yet discovered, and has a powerful magnetic field. The pulsar spins about. The object pulses 183.8 times a second and is located about 27,000 light-years from Earth.